Having said ‘goodbye’ to Amy, Chris and Matthew at the end of June, we’re delighted now to be saying ‘hello!’ to Catriona and Susan, our volunteers for 2016-17. Susan, from Shotts, and Catriona, from Helensburgh, are now safely installed in the church flat in the heart of our parish and are beginning to get to grips with the range of duties that they’ll be involved in during their year in Arbroath. 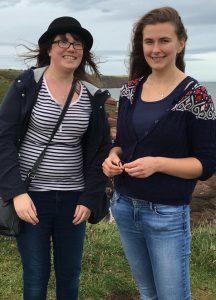 They’re here under the auspices of the Church of Scotland’s Volunteer Vocations’ programme and we hope that both of them will find it to be a hugely important year as they seek to discover what they’re being called to. We wish Catriona and Susan well and look forward with anticipation to all that they will bring to our congregation and community in the months ahead.